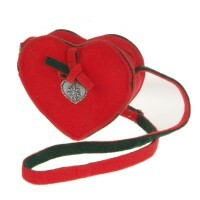 To this day traditional German costumes like Dirndl or Lederhosen are worn to many occasions such as wedding celebrations, folk festivals or discos even outside of Germany. 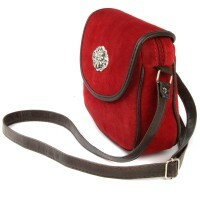 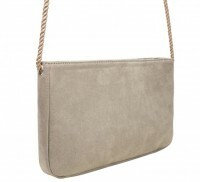 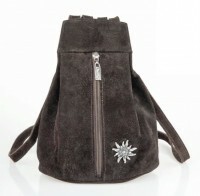 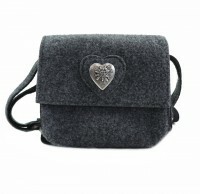 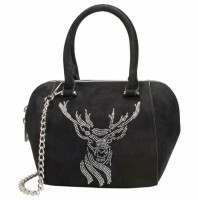 Accessories such as felt bags round off your outfit in style and detail. 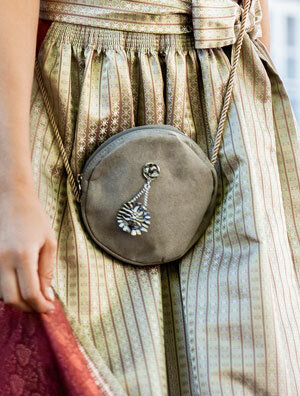 The classic Dirndl, whose history of success originally began as a simple work dress for peasant women, has a long tradition dating back to the 19th century. 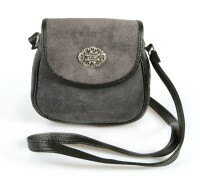 During this time the garment has changed a lot. 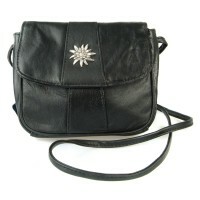 In addition to the classic, long version, there are now also shorter versions, which are very popular among younger wearers. 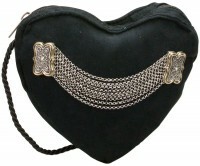 The use of different fabrics, color combinations and ornaments ensures that the Dirndl as a typical German costume never gets boring and it fits the taste of many different women. 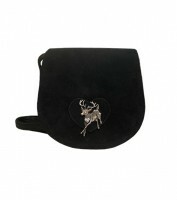 With matching Trachten accessories, you can not only complete your Dirndl, but also further individualize your look. 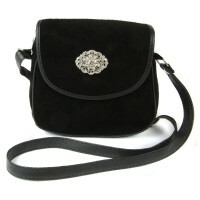 Discover our large selection of practical felt bags, with which you can always carry everything important with you. 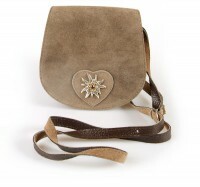 Whether small or large - in our extensive online shop you are guaranteed to find the Dirndl bag that perfectly matches your outfit and your needs. 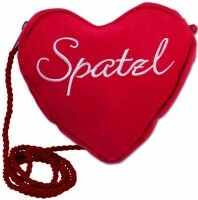 We carry both handy, modern Oktoberfest bags for women, as well as spacious shoppers, in which all sorts of utensils and souvenirs can be stowed away from the folk festival. 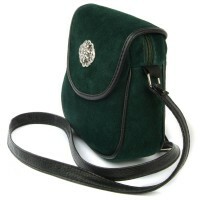 Spacious shoppers not only cut a fine figure at the Oktoberfest - they also prove to be useful companions in everyday life, as they can be used to stow away purchases and small items of luggage in a simple and stylish way. 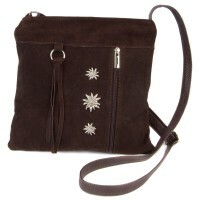 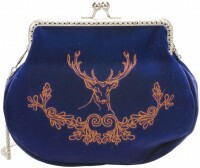 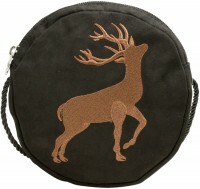 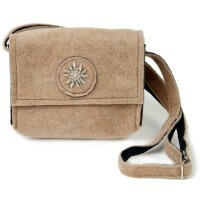 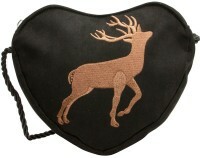 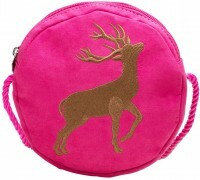 Noble patches or imprints with rustic deer motifs or appetizing gingerbread make these Dirndl bags a real eye-catcher. 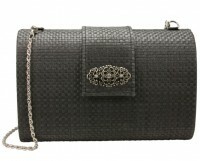 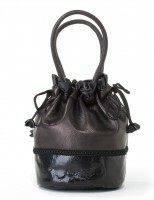 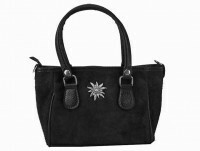 Leather handbags are persistent, durable and look very traditional. 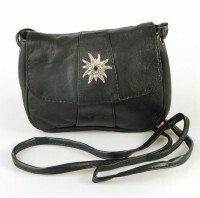 They can be optimally combined with Dirndl jewelry, which contains leather elements, and round off a classic Dirndl visually. 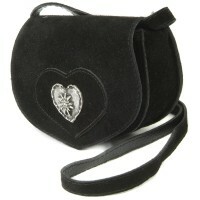 Sweet felt bags are especially popular with teenagers and young Dirndl wearers, because they are not only lightweight, but also inexpensive. 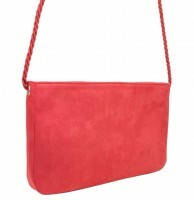 Even for people who consciously live without animal products, felt bags are an elegant alternative to the usual leather bags. 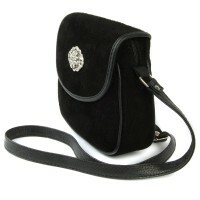 Of course, these gorgeous bags can also be combined with everyday outfits – your favorite bag will complete your Oktoberfest look as well as your everyday jeans and T-shirt outfit. 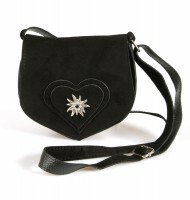 When choosing your new Dirndl bag you will not only find different materials, but also imaginative shapes to choose from. 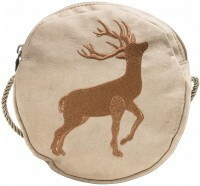 Round models with applications and embroidery, such as the traditional round bag with deer embroidery in black, is also available in the colors beige, pink, red and olive green in our shop. 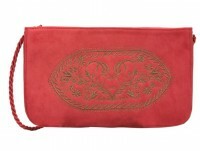 There are also stylish clutches made of red or black velvet, such as the traditional velvet purse Hirsch & Eichenlaub in red, which also looks good on festive occasions. 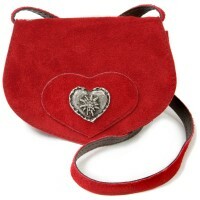 A heart-shaped Dirndl bag looks great not only on little folk fans - it also completes the look of adult ladies skillfully. 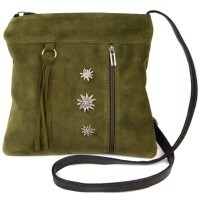 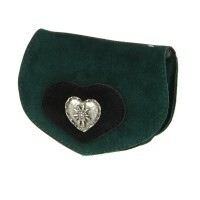 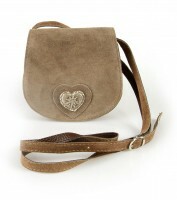 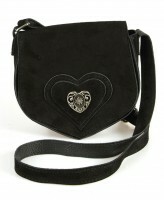 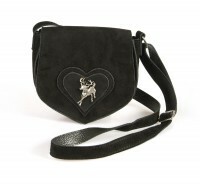 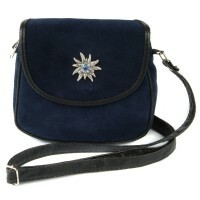 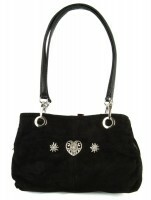 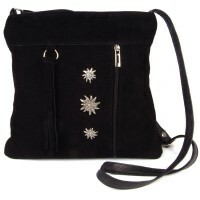 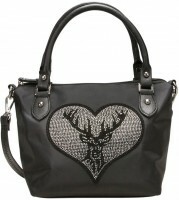 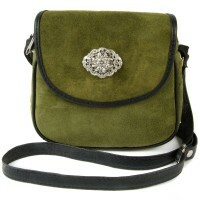 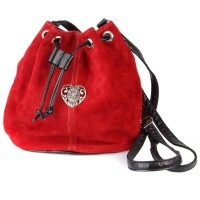 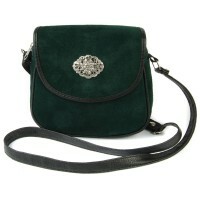 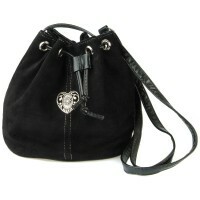 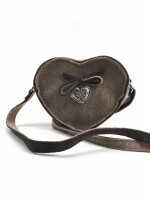 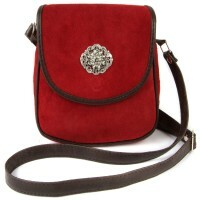 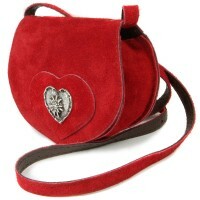 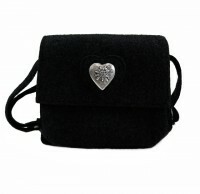 Give your outfit a playful, romantic accent, for example, with the black heart bag with deer and flower tendril. 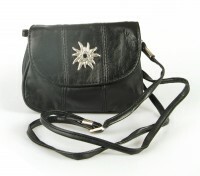 Our extensive online shop offers you a large selection of German costumes for women, men and children as well as all the accessories you need to complete your outfits. 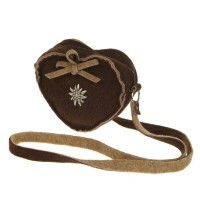 In addition to felt bags, you will also find pretty Dirndl necklaces and charming Dirndl blouses. 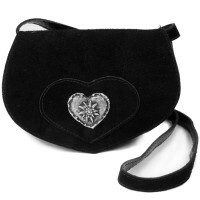 Thanks to our wide selection of clothing sizes, people of all sizes can find Dirndl and Lederhosen that promise great comfort through a good fit. 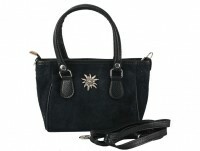 In addition to the fair prices, our excellent service will convince you. 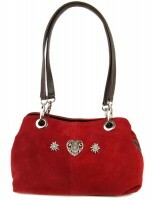 Secure payment options and fast delivery times ensure that you will enjoy your order.